The Bicentennial Time Capsue is a brick cylinder 3 1/2ft in diameter with pre-cast concrete cast with 2 eagles sandblasted into sides. 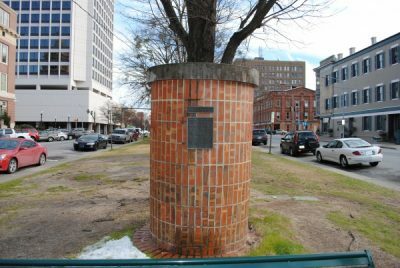 This unusual time capsule was placed to celebrate the Bicentennial of the United States in 1976. It is a large brick cylinder about 7 feet tall and 5 feet across. The plaque on the structure says it was designed by the Middle Georgia Chapter of the A.I.A. and built by The Home Builders Association of Macon. It is too tall to see what is on top and if one does not look closely it might be mistaken for some kind of post. The capsule is scheduled to be opened on the nation's tricentennial on July 4, 2076.